This intensive 3-day course provides a state-of-the-art review of satellite communications networks and applications from system and service perspectives. Owing to innovations in high-throughput satellites, advanced modulation and coding (MODCOD), solid state power amplification and mobile antennas, service reach and profitability require advanced thinking and innovation. Technical, operations, and business professionals, as well as newcomers to satellite technology learn the fundamentals, architecture, and development of modern satellite networks, with emphasis on cutting-edge broadcast, broadband interactive, and mobile applications. Topics include satellite and ground station principles, basic satellite link budgets, digital image and full-motion video for broadcast distribution using the MPEG 4 and DVB-S2 standards and extensions, Internet Protocol (IP)-based data performance optimization over satellite; Ku- and Ka-band Very Small Aperture Terminals (VSATs) applied to fixed networks as well as those having location flexibility; and advanced broadband capabilities of high throughput satellite systems currently in use and under development. Emphasis is placed on the proper selection of requirements, technologies, and their providers (space and ground), and on the most effective ways to architect and operate the associated satellite networks. 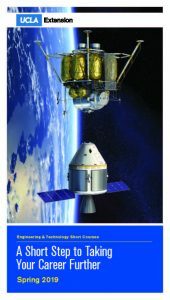 The text, The Satellite Communication Applications Handbook, Second Edition, Bruce Elbert (Artech House, 2004), and a complete set of updated lecture notes are distributed on the first day of the course. The notes are for participants only and are not for sale. Bruce R. Elbert, MSEE, MBA, President, Application Technology Strategy, LLC., Georgetown, Texas; and Adjunct Professor (ret), College of Engineering, University of Wisconsin, Madison. Mr. Elbert is a recognized satellite communications expert and has been involved in the satellite and telecommunications industries for over 40 years. He founded ATS to assist major private and public sector organizations that develop and operate cutting-edge networks using satellite and other wireless technologies and services. During 25 years with Hughes Space and Communications (now Boeing Satellite Systems), he directed communications engineering of several major satellite projects, including Palapa A, Indonesia’s original satellite system; the Galaxy follow-on system; the development of the first GEO mobile satellite system capable of serving handheld user terminals; and the provision of multiple spot-beam Ku and Ka band satellites for local-into-local DTH and satellite broadband. Mr. Elbert also worked as a communications engineer for the INTELSAT system and developed link analysis tools while a radio officer in the U.S. Army. He has written eight books on telecommunications and IT, including Radio Frequency Interference in Communications Systems (Artech House, 2016); The Satellite Communication Ground Segment and Earth Station Handbook Third Edition(Artech House, 2014); Introduction to Satellite Communication, Third Edition (Artech House, 2008).